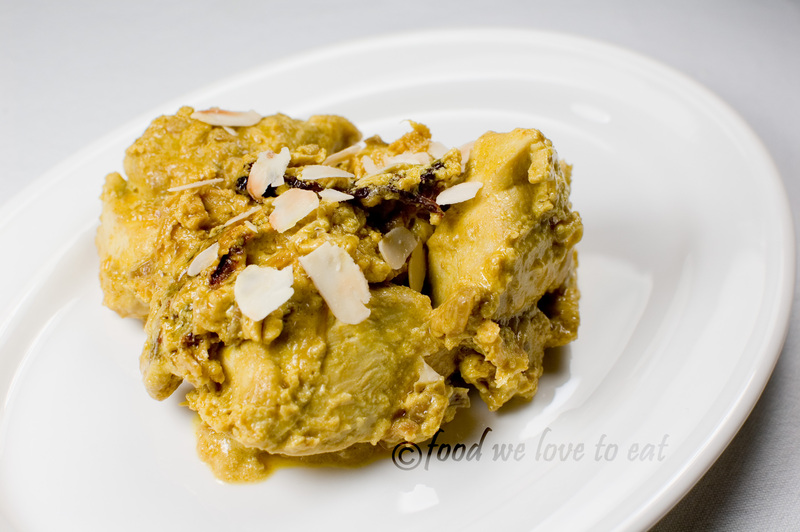 [A]: It is widely believed that this dish originated in the royal kitchen of the Mughal emperor Shahjahan. Certainly the delicate spice flavours point towards a mature kitchen where the quality of the ingredients is the primary focus. “Passanda” means “favourite” in Urdu and many North Indian languages have very similar sounding words for the word favourite. It is meant to be cooked with the prime cut of meat (i.e. the favourite bit). The quality of the meat is paramount as the dish is very mild with subtle fragrance of cardamom in the sauce – nothing overwhelming at all. So I would recommend buying the best chicken breast money can buy for this dish. I used free range Norfolk chicken breasts, the best that my local butcher could supply. If, like me, you prefer the taste of meat in your cooking, it would be better to cut the breast into 2-3 chunky pieces each. However, if you prefer the taste of the sauce more that the meat, you can cut the meat into smaller pieces. The ingredients below are sufficient for 4 servings. Heat the ghee in a large sturdy pan (or karahi) over medium heat. When the ghee has melted completely, add the whole chillis, cinnamon and cardamom. Fry for about 30 sec or till the spices start to release their sweet aroma. Then add the chopped onion and fry for 10 minutes till the onion takes on a golden brown colour. The juice from the onion should have been released so that they have caramelised and would therefore assist the ground spices to blend in the sauce. Stir in the ginger and garlic and fry for another 2-3 minutes followed by the ground coriander, turmeric and chilli powder. Once this spice mix is ready, introduce the chicken pieces and stir well so that the chicken pieces are coated on all sides with the spice mix. Then add the thick yoghurt, ground almonds, salt and water. Increase the heat so that the mixture begins to simmer. Reduce the heat to medium again and let the gentle simmer continue for 15-20 minutes. The aim is to reduce the sauce to a thick, rich, dry paste that coats the chicken. As a result a lot of attention is needed towards the end to ensure that the thick sauce doesn’t burn and discolour. A constant gentle stir towards the last 5 minutes will ensure that the sauce touching the pan doesn’t burn. As always with any meat, once cooked completely it is best to let it rest for at least half an hour. If needed, slightly warm it up before serving. Scatter the toasted flaked almonds on top and serve with fragrant basmati rice.